Jordy Smith and Bianca Buitendag have advanced to Round 4 of the men’s and women’s events at the Rip Curl Pro Bells Beach, the second stop on the 2016 Samsung Galaxy World Surf League (WSL) Championship Tour (CT). Both South Africans suffered early exits at the first event of year on the Gold Coast of Australia two weeks ago and, being the tallest surfers on their respective tours, have relished the additional size and power of the waves at Bells Beach, the iconic venue for this event for past 55 years. Smith, after finishing second to John John Florence (HAW) in their non-elimination Round 1 heat held in one metre waves on Friday, was able to use his full repertoire of carving rail manoeuvres to defeat dangerous injury replacement Adam Melling (AUS) in unruly double overhead, three metre conditions on Saturday. The Durbanite continued his momentum on Sunday, slashing his way through the 1 to 1.5 metre onshore surf on Sunday to post victory over Kai Otton (AUS) and advance to Round 4. There he faces three-time world champion and four-time and defending Bells champion Mick Fanning (AUS) and rookie Conner Coffin (USA) with the heat winner progressing directly to the quarterfinals while the other two compete in elimination two-man Round 5 heats. Smith, a three-time semifinalist at Bells, and Fanning are the only top-12 seeded surfers remaining in the bottom half of the draw following a series of major upsets that saw Joel Parkinson, Florence and Gabriel Medina sidelined by rookies Coffin, Caio Ibelli (BRA) and Davey Cathels (AUS), while Kelly Slater was ousted by Michel Bourez (PYF). Buitendag started her Bells campaign with a well deserved Round 1 win over six-time world champ Stephanie Gilmore and rookie Chelsea Tuach of Barbados to skip Round 2. However, the 22 year-old from Victoria Bay was relegated to third place by reigning world and Bells champ Carissa Moore and fellow Hawaiian Malia Manuel in Round 3. Buitendag faces a match up with another Hawaiian in Alessa Quizon when competition resumes with the winner advancing to a quarterfinal clash with Sally Fitzgibbons (AUS) and the loser eliminated from the event in equal ninth place overall. Surfline, the official forecasters for the event, are predicting a dropping swell and onshore winds for Tuesday and Wednesday. Clean but small conditions are likely for Thursday before the swell fills in again with offshore winds from Friday. Event organizers will reconvene each morning at 8am local time (11pm SA time) to assess conditions for a possible recommencement of competition. All the action from the Rip Curl Pro Bells Beach can be watched LIVE at WorldSurfLeague.com which also features full results, images, video footage, the Heat Analyser, news, forecasts, and more. On form Jeffreys Bay teenager Matthew McGillivray posted the only perfect 10 point score and went on to finish runner-up in the Papara Pro Surf, a World Surf League (WSL) QS1,000 rated event that ended in Tahiti yesterday. Competing in the punchy 1.5 metre beach break conditions at Taharu‘u Beach, McGillivray completed two frontside air reverses on the same wave in his semifinal match-up against Shane Holmes (AUS) before battling through a see-saw final with eventual winner Dimitri Ouvre, the only professional surfer from the small Caribbean island of Saint Barthelemy. In the final, McGillivray had a good start with a 6.25 on his first wave to take an early lead. Ouvre started with a 5.25 and added a 7.75 to take the lead. The two surfers then exchanged rides with a 7.9 for Ouvre followed by a 7.6 for the South African, with Ouvre ultimately securing the title by 15.65 points to McGillivray’s 13.85 (both out of 20). In his first full year on the WSL Qualification Series (QS), McGillivray was the highest rated South African in the rankings in the 62nd place (out of 569) coming into the Papara Pro. He finished fourth in the Burleigh Pro in Australia in February, won the trials event at the QS6,000 Newcastle Surfest and placed third in the Rangiroa Pro in Tahiti last week. At Papara he was again on fire and advanced in first place through five consecutive heats to reach the final. His earnings of US $1 000 (approx R15 500) and 750 rankings points will see the 18 year-old move into the top 40 on the QS rankings. 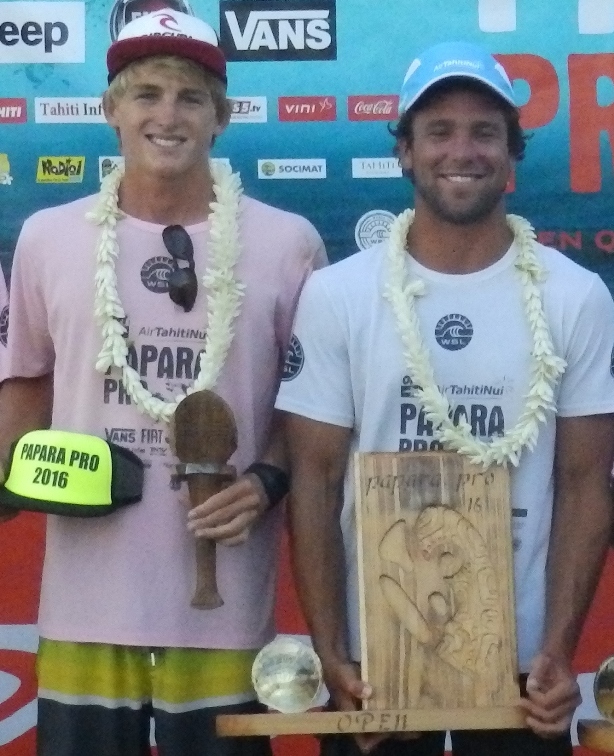 Slade Prestwich (Durban) and Shane Sykes (Salt Rock) were the only other Saffas in Tahiti and finished 33rd and 25th respectively.